So this was the first hat I made for myself. After months spent knocking up things for other people (my aim was to make something for everyone at Christmas but I ran out of time in the end) I decided that I would make myself something - especially as I was going hatless while my friends were swanning about in my original creations. 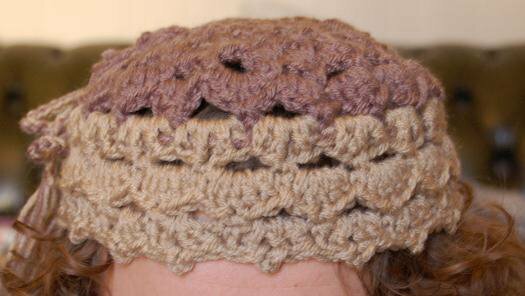 This was the Cloche Cap that I made using this pattern. It was nice and easy to do, but no matter how large the hook was, I couldn't get it to fit the gauge. Possibly because I was intent on only using one strand of double knitting rather than 2 strands as requested in the pattern. Because I'm a cheapskate. So, as expected the hat came out a little on the small size, but it fitted my pin head fine. You can see my charming boyfriend is reluctantly modelling it for me and it looks a little tight for his manly-sized head, but for me it was just about right. Despite this, I soon concluded that it had another fatal flaw. It didn't suit me. This in spite of the fact that I generally look pretty spiffy in hats. Problem was, it looks better perched on a curly mop, and it just didn't really sit right on my straight locks. Well that's my excuse anyway. The fact that my fellow straight-haired, pin head friend came over the other day and took my cloche along with the other hat I made her (more of that another time) is beside the point. She tells me she's not wearing it, however, because it doesn't cover her ears which is no good for winter. So failure all round then. No wait! There's a happy end to this tale. Having seen how good it looked on Milway's curly locks, I decided it would be a great wheeze to make a similar hat for my brother-in-law, a great tall man with long flowing curly locks of silver and blond. Mighty impressive hair indeed, in dire need of a house cap to lend even more of a distinguished air. I also knew it would annoy aforementioned niece. Incentive enough for anyone. Alert to the undersized failings of the last one, I added an extra shelly bit at the start, and ended up with a huge hat that I thought would be far too large. It did end up being on the large size, but still within the limits of acceptable hat-to-head size ratio. Brother-in-law was, of course, delighted. Niece was, of course, appalled. So success all round then. Except she got the better of me. While my father was down for Christmas he took a shine to the hat and took to wearing it. Come leaving day, she convinced him to thieve the hat so now I'm the one who gets to be humiliated by my father and she gets to chuckle in a self-satisfied manner. Truly, there is no justice in the world.